While I love elements of Shabby Chic – specifically the acceptance of an eklectic mix of old and new – one thing I haven’t liked is how it has been taken over the top. Everyone does a distressed finish on a new piece and most of the time it just looks like fakey crap! 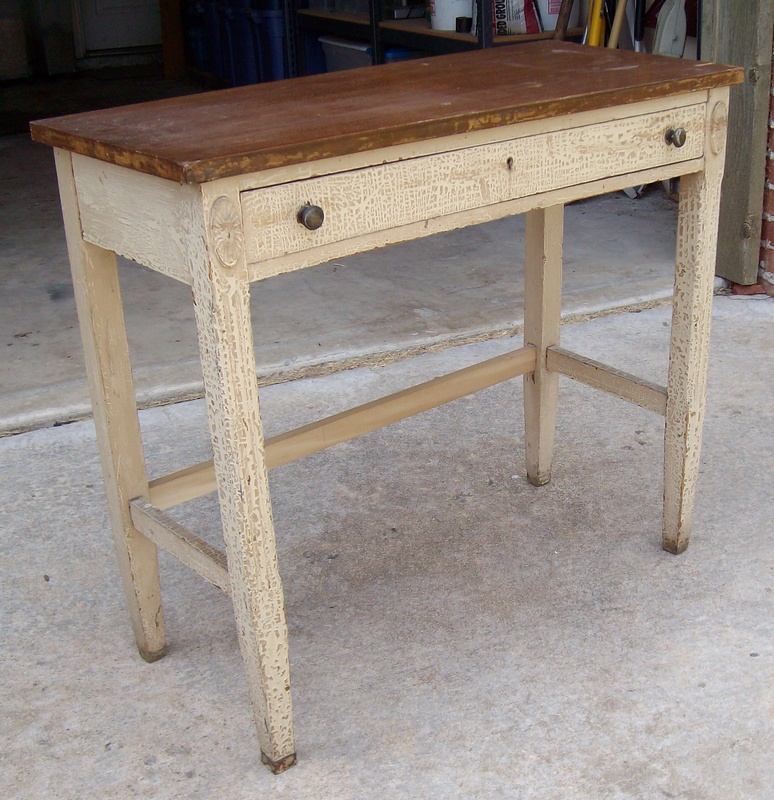 Here is a recent table I bought ($28) with a natural, distressed finish (click photos to see a closer view). 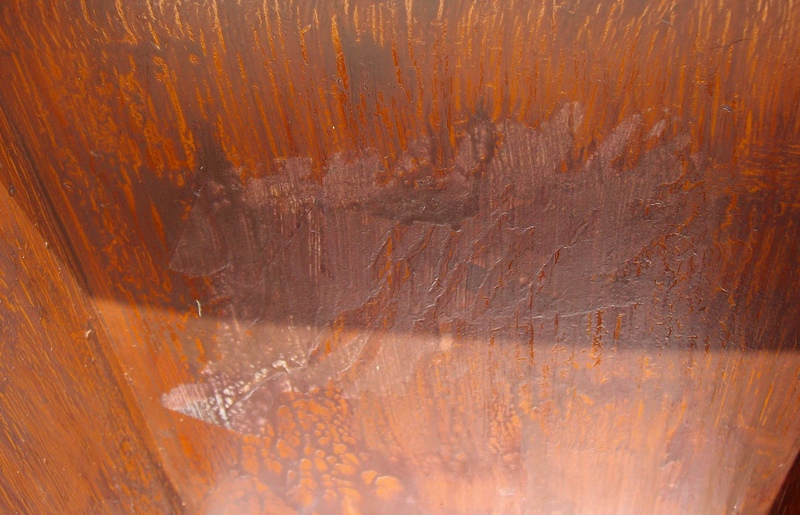 The stain was put on over the bare wood in a sloppy way, probably not left to dry properly, an alligator pattern emerged and brush strokes are evident. This wasn’t “faked” up by someone in their garage and the finished, aged patina is richer for it. The tabletop surface has a nice, multi-level depth due to natural wear and tear and the initial, poorly done staining job. Naturally aged or distressed items always have an authenticity to them that artificially produced work just can’t duplicate. Although the popularity of Shabby Chic decorating has raised the prices of these pieces, you can still find them at a reasonable cost. They are also great to mix into a room with newer furniture to give an overall feeling of age and live-in comfort. Another table (about $35) I found has a lovely soft alligator finish in soft creams. This table was too deep for my intentions, so we took the legs apart, cut off about four inches and then re-glued and fastened the legs back to the surface. It’s color and size has allowed it to be moved around the rooms from entry table, to corner table for a laptop and as a side table to a couch. 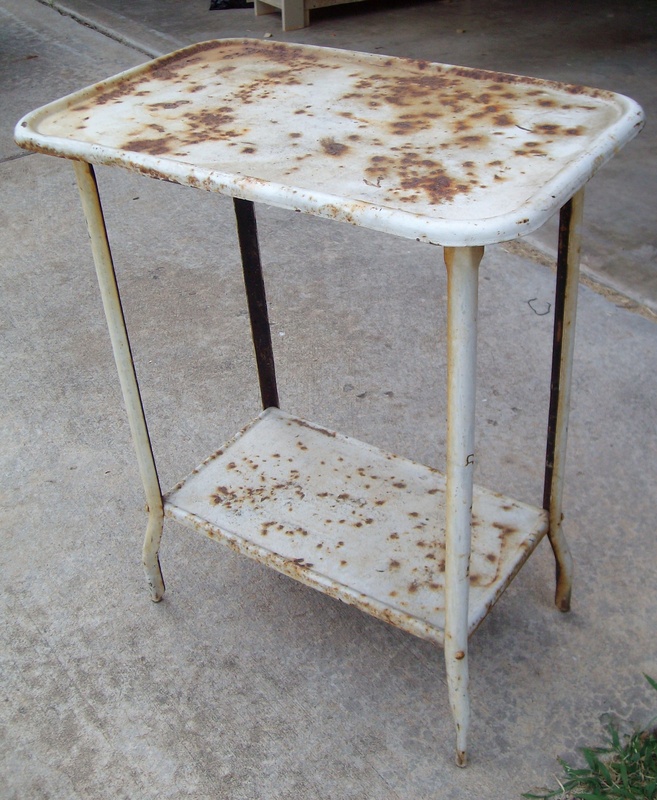 And here is another lovely distressed finished – this time, natural rusting of a metal table (about $30). I love the second shelf (great for organizing and displaying) and the slightly curved leg. I ended up using this table in the boy’s room. I didn’t want to spend big bucks on a room and piece of furniture that was seldom used so I was lucky that I received a free dining room table from a relative. It wasn’t a family heirloom but it was free, and you can’t beat free! I’m guessing it’s from the 1940’s era. The top and sides are veneer and the legs have a nice half circle effect that is appealing as well as some decorative molding (see corners). I had a carpenter make a new, unfinished table leaf ($100) to replace the one that was long missing so now the table can sit from 6 to 8 people. 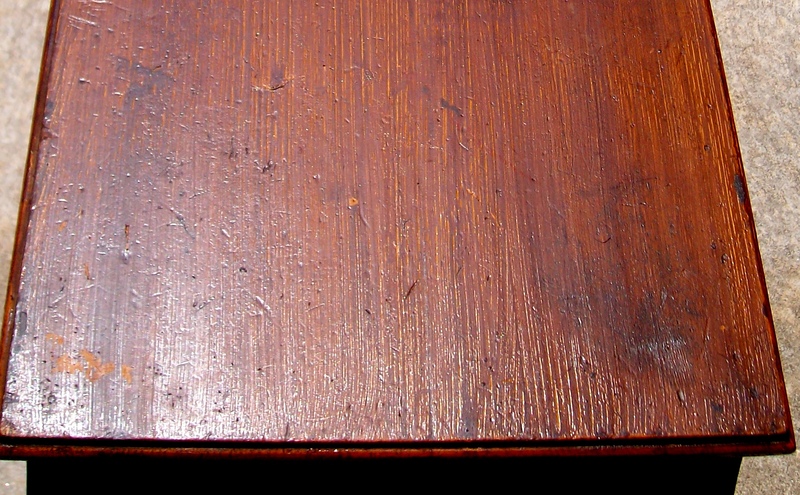 Overall, the table was in pretty poor condition, with an irregular stain, watermarks, and chips to the veneer. We repaired the damaged veneer on the tabletop sides with a X-acto knife cutting out the damaged area to a rectangle. Veneer trim (Red Oak) was cut to fit and then glued and clamped to fit. 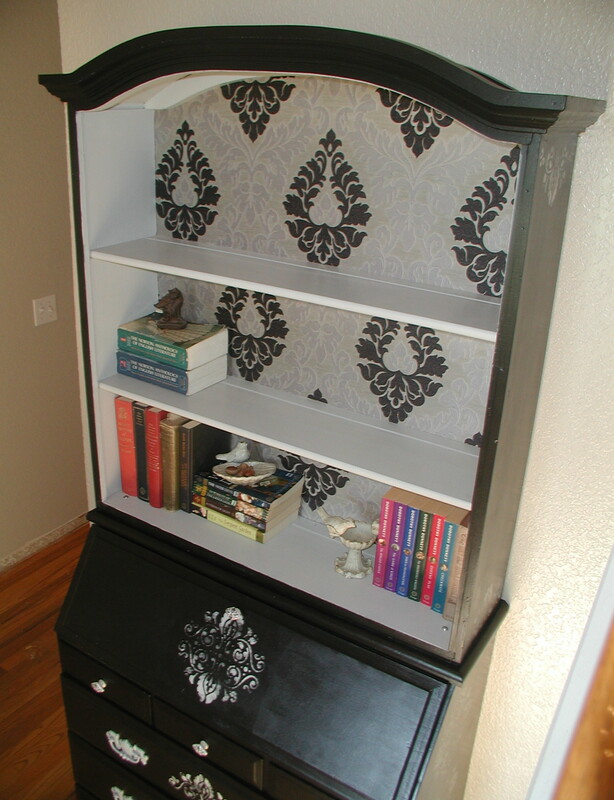 The repair was lightly sanded to a smooth surface and the area painted black. 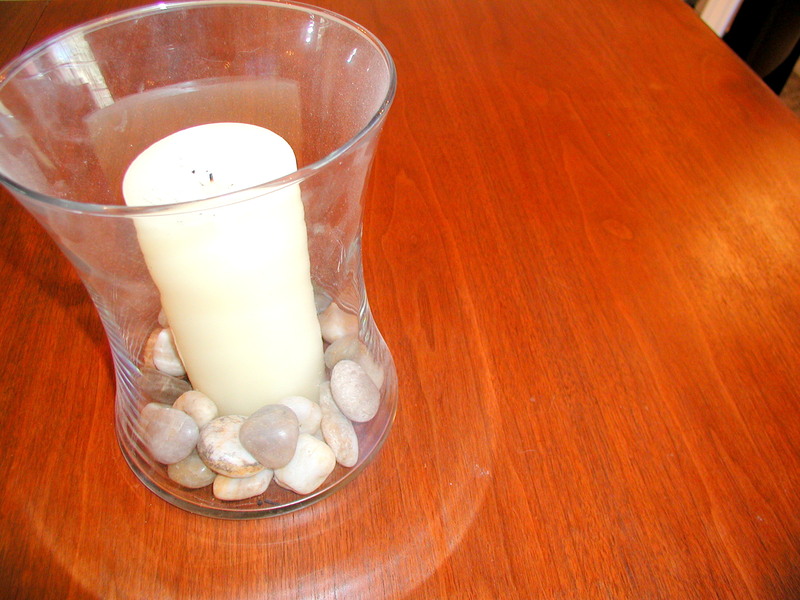 We also glued down veener on the edge of the table that had started to peel up. When using clamps be sure to use a scrap to take the initial pressure from the clamp foot or you might form an unwanted impression into your project. You can see, left, the sanded tabletop has an unevenly colored surface which I had to deal with. The legs and tabletop sides were painted black. They were sanded back for a distressed appearance; remember to sand prominent areas where natural pressure and wear would occur from use. 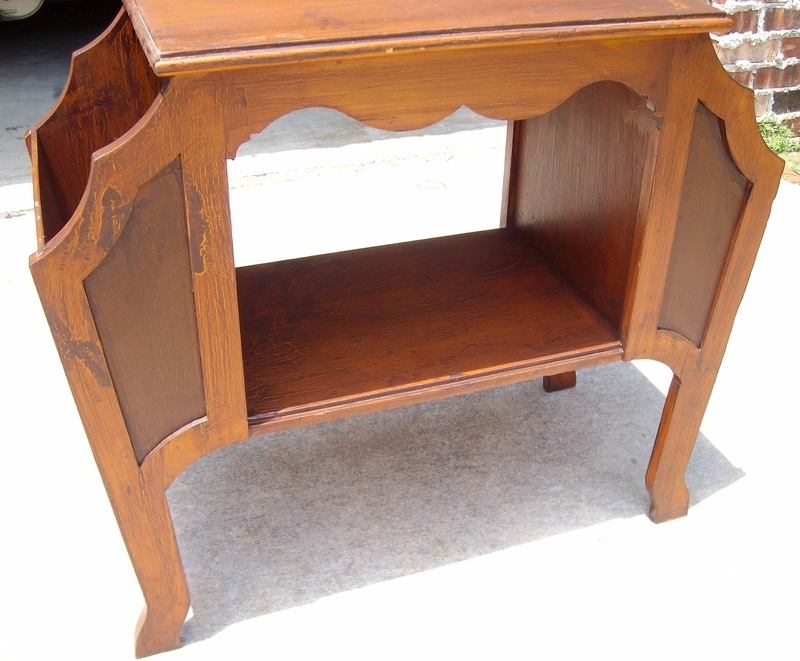 Cabots Natural Walnut stain was rubbed in and wiped off. This darkened the newly sanded areas making it look more aged. For the tabletop, I first tried chemically stripping the surface but that wasn’t very effective. I resorted to the Mouse Sander with a fine grit. Anything rougher and I was liable to rip or gouge the veneer. I went with three rubbed in coats of Cabot’s Natural Walnut stain, fine sanding with a tacky cloth between coats. Finally, I coated with rub on polyuretane, gloss coat, and did three more coats, handsanding lightly and using a tacky cloth in between sessions. Price: Table ($0); extra leaf ($100); leftover black paint, sanding paper, stain, tacky cloths ($25), 6 dining room chairs ($360). Wow! I was really pleased with the finished result and couldn’t be happier!